There really is a difference. And right now we’re loving fougasse. So much that we have entirely rejected the idea of making focaccia. This month, I have the honour of hosting the kitchen of the month and have asked the BBBabes to bake fougasse as well and weigh in with their thoughts on the subject. 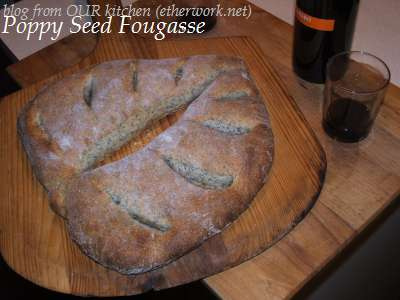 When I first read about fougasse, I thought it must be virtually the same as focaccia. I dismissed making fougasse because I’d made focaccia. They were the same, after all…. But because of still being certain – what with my terrific retention skills when reading – that fougasse was simply French focaccia, I used the ingredients for our focaccia recipe along with Robertson’s shaping and baking method to make our first fougasse. Because fougasse is baked on a stone instead of on an oiled pan, there are more crispy bits. Not too crispy though… it’s juuuuust right! Surprisingly, there are few mentions and just a handful of recipes for fougasse in all the various bread baking books we have. Imagine a small, round and flat loaf, so dense that a knife point cannot penetrate and slips off its surface, and you are obliged to break it in half with your hands. […] This was the bread of poverty, the bread of the peasant, baked under an inverted iron pan over which the ashes of the fire were heaped. The English called them ashcakes, and the French fougasses. The lyrical, ladderlike bread known as fougasse is my Provençal pizza. I take my favorite bread dough, shape it into individual breads, then flavor them with whatever delicious toppings I might have on hand – black or green olives, home-cured anchovies, marinated baby artichokes, capers, bits of fresh goat cheese, a touch of hot pili pili oil, or simply a brush of olive oil and a scattering of fresh thyme and coarse sea salt. The most traditional fougasse is flavored with bits of browned pork fat (what we call cracklings), but one also finds sweet versions prepared with a butter-rich dough or briochelike butter and egg dough flavored with orange flower water. The origin of the word is a mystery, though in the rest of france a fouace can refer to any sort of flat, baked galette either sweet or savory. [T]raditional French ladder or lattice-shaped bread [… is …] crisp, deeply walnutty, dense and chewy […] This bread is moist and full-flavored eaten by itself, and it is a babulous complement to Roquefort cheesee and Sauternes or port. The Provençal flat bread known as fougasse is a crust lover’s dream: it’s flattened and scored, which maximizes the surface area that gets exposed to direct heat but still leaves plenty of room for toppings, such as olives, herbs, sea salt, and cracked pepper. A traditional southern French flatbread, fougasse can be flavored with herbs, olives, and lardons (fried bacon or pork belly), and cut to resemble a leaf or ladder just before sliding onto the hearth to bake. The dough is pressed into a rectangular shape as for focaccia, and a bench knife is used to make swift, decisive cuts in the dough on the peel before it’s cast onto the hearth to bake. Chad Robertson says for “herbs, olives, or lardons, incorporate the ingredients early in the bulk rise, after the first turn […] The just-baked fougasse can be brushed with olive oil and seasoned with salt and fresh or dried herbs after it’s pulled from the oven to suit your taste.” Wells suggests putting extra flavourings on top like a pizza, just before baking. Because we were planning to bake olive fougasse in the barbecue and often have to turn the fougasse over, I used Robertson’s idea. After the first couple of times making fougasse, I noticed that in their books, both Patricia Wells and Chad Robertson suggest using lean bread or baguette dough. ie: no oil in the dough itself. So. Here is what I propose. Use whatever ingredients you like in your fougasse. As Patricia Wells says, use your favourite bread dough. But please follow the shaping and baking methods set out below. Make the fougasse plain. Or fill it with things. Shape it however you like. Bake it in the barbecue or the oven. Whichever is more convenient. Have fun!!! Mix, knead and allow your favourite bread dough to rise to double. If you are adding anything like olives, sun-dried tomatoes, onions, caramelized garlic cloves and/or walnuts, mix them into the dough near the end of kneading it or on the first turn of the dough. If you are wanting herbs/spices on top, please add them just before baking. Shaping: About an hour before baking the fougasse, turn the dough out onto a lightly floured board and press it out into an oval (or a rectangle; or a circle). Using a floured rolling pin, roll the dough out until it is about 1 cm (.5 in) thick. Baking If the weather is fine or just too hot to be turning the oven on, fougasse can be baked in the barbecue. If it’s raining or just too cold and dark, of course the fougasse can be baked in a conventional oven. Baking in the Barbecue: Put a pizza stone over the half of the barbecue you will turn on and preheat the barbecue to high. Transfer the fougasse to the pizza stone that is sitting over direct heat. Close the lid of the barbecue and bake for about 8 minutes, rotating the stone once or twice or thrice to account for uneven heat in the barbecue (Hot Spots!!!). Then move the stone over to cook with indirect heat (lid down again) until the fougasse is done (about another 8 minutes)… our gas barbecue can be turned off on one side. Watch for hotspots and move the fougasse around to keep it from burning on one side. Because of the heat from the bottom, we like to turn the fougasse over. Just make sure to wait until the top crust is relatively well-formed. Baking in the Oven: Put a pizza stone on the middle or top shelf of the oven and turn it to 400F (200C). Transfer the fougasse onto the hot stone and bake for about 15-20 minutes, turning it around at least once to account for uneven oven heat. The finished fougasse will be deep gold on the bottom and gold on the top. When the fougasse done, remove it from the heat and allow to cool on a well-ventilated rack. To serve, break it apart and dip it into good quality olive oil with herbs if you want. 1.) Corn Meal: This is to make it easy to move the shaped fougasse from the peel to the hot stone. We use a medium-grind corn meal. I’ve heard that semolina flour works as well and apparently, rice flour may be used as an alternate. Parchment paper is definitely a viable alternative with the advantage that it can be placed in the oven and slipped out once the fougasse is half baked. 2.) Pizza Stone: Pizza stones are available at most kitchen supply stores in the larger cities (and possibly the smaller ones too?) in Canada. They cost about $10 and often come with a pizza wheel inserted in the box. They may be a little lighter weight and thinner than a conventional bread stone but the advantage is that they fit easily into a barbecue and they work pretty much as well to protect bottom crusts from burning to cinders. 3.) Shaping and slashing: The traditional shaping for fougasse is in a leaf or ladder shape. But it can be shaped in any way you want. This was an attempt at a Jack-o-fougasse. I’m afraid I didn’t open the eyes enough before baking it. Robertson shapes his fougasse and allows it to rise (covered with a tea towel) for 2 to 3 hours. Wells shapes and slashes her shaped fougasse at the same time and allows the fougasse to rest for about 10 minutes before baking it. Beranbaum also shapes and slashes at the same time, allows it to rest for about 15 minutes before baking and suggests using scissors (and gentle pulling with fingers) to open up any of the slashes that have closed during that time. Depending on the temperature of your kitchen, you can start this in the morning if it’s cool and in the early afternoon if it’s warm. Spoon the yeast into the bottom of a medium to large sized bowl. (I use a casserole dish). Pour the water over top and whisk until the yeast has dissolved and the mixture looks like diluted cream. Add the olive oil and dump the flours, malt and salt overtop. Using a wooden spoon, mix together until the mixture comes away from the side of the bowl. Turn the dough out onto an unfloured board. Wash and dry the mixing bowl (cleans the bowl AND washes your hands). Using a dough scraper as your friend and ally to keep the board clean, hand knead for about 5 minutes until the dough is soft and silky. Put the kneaded dough into the clean mixing bowl. Cover it and leave on the counter (out of drafts) until it doubles. Cut olives in half and remove the pits. In a decent sized mixing bowl, whisk the yeast into the water. Using a dough scraper as your friend and ally to keep the board clean, hand knead for about 5 minutes until the dough is soft and silky. About a minute before finishing, knead in the olives. I’m a little less casual about measuring for baguette dough and usually use our digital scale to weigh the ingredients. This is enough to make one medium-large sized fougasse and two baguettes. Yeasted Water: On the evening before baking the bread, spoon the yeast for the yeasted water into the bottom of a small bowl. Pour in water and whisk together until dissolved and creamy looking. Scrap Dough: put flour and salt into the bottom of a medium sized bowl (I use a smallish lidded casserole dish). Pour in 80 gm of the yeasted water (reserve the leftovers for the Poolish) and use a wooden spoon stir the ingredients together. This will create a stiffish dough. Without adding any extra flour, knead in the air and/or the bowl until the dough is smooth (about 5 minutes). If it seems like there is too much flour, add a drop or two of water. Place the kneaded scrap dough into a smallish clean bowl that is large enough for the scrap dough to double. Cover the bowl with a plate and leave it on the countertop in a draft-free area until the next morning. Poolish: put the flours into the medium sized bowl used for mixing the scrap dough. Add water (making sure to include the leftover yeasted water) to the flours. Stir with a wooden spoon until the flours are encorporated. This mixture will be quite sloppy. Cover the bowl with a plate and leave on the counter (out of drafts) overnight. Actual Dough: On the next morning (the day for baking the bread): In a largish bowl, whisk yeast into lukewarm water until the mixture looks creamy. Stir in all of the above Poolish that should be quite bubbly. Add the flour and salt and using a wooden spoon, stir until the dough pulls away from the bowl and the flour is pretty much encorporated. Cover with a plate and set aside to sit on the counter for about 10 minutes. Turn the dough out of the bowl onto an unfloured work surface. Place the scrap dough on top. Wash and dry the bowl. This prepares the rising bowl AND gets your hands clean. Without adding any extra flour, knead the doughs until silky and the scrap dough is fully encorporated into the rest of the dough (5 to 10 minutes). Once again, let your dough scraper (a spatula works) be your friend when the dough is sticking to the board. Keep scraping up any dough that is on the board and adding it back into the actual dough so the board is always clear. Put the kneaded dough into the clean mixing bowl. Cover with a plate and allow to rise in a no-draught area (warm room temperature) for 20 minutes. After 20 minutes has passed, with the back of your hand against the inside of the bowl, slip your fingers down the side of the bowl to the bottom and gently scoop the bottom of the dough up and around to the top. Turn the bowl a quarter turn and repeat. Do this maneuvre 4 times in all (try not to disturb any bubbles too much). Cover and allow to rise in a no-draft area (warm room temperature) for 20 minutes. Repeat this step three times in all. (This step is done at 20 minutes, 40 minutes, 60 minutes after the first kneading.) After the final time, cover and allow to rise at room temperature until it has doubled. A good way to tell if the dough has doubled is to wet your finger and poke a hole in the top of the dough. If the hole fills up, it hasn’t risen enough. If there is a whoosh of air and the dough deflates a little, it has risen too much. If the hole stays in exactly the same configuration and the dough remains otherwise intact, it is ju-u-st right. When the dough has doubled, it’s ready to shape. 4.) Yeast and Water: Field calls for active dry yeast; Glezer calls for instant yeast. There’s nothing wrong with instant yeast; we just don’t happen to have any on hand. I use active dry instead. And a LOT less than either Field or Glezer suggested. N.B. Under no circumstances do I ever use water from the hot water tap. Water from the hot water tap sits festering in the hot water tank, leaching copper, lead, zinc, solder, etc. etc from the tank walls… the higher temperature causes faster corrosion. Of course, saying that it is unsafe to use water from the hot water tap might be an urban myth, but why tempt fate? I heat the water in our kettle. But I LIKE warm bread right out of the oven: If you wish to reheat leftover fougasse, put them on the top shelf of the hot barbecue for a few minutes. OR… turn the oven to 500F for 5 minutes or so. Turn the oven OFF. Put the fougasse in the hot oven for ten minutes. I haven’t yet made Rose Levy Beranbaum’s fougasse (remind us to get some walnuts!) And I really must try Susan’s Gorgonzola Fougasse With Figs and Pecans (remind me to get figs at the same time as we get the walnuts!). But I have made fougasse with poppy seeds to go with grilled salmon. If you don’t have a blog, no problem; we still want to see and hear about your bread! Please email me with the details so your fougasse can be included in the roundup. Karen, Bake My Day: Fougasse baked by the Bread Baking Babes! Katie, Thyme for Cooking: Fougasse v Focaccia: What IS the difference? Natashya, Living In The Kitchen With Puppies: The Bread Baking Babes bake Fougasse! Please note that today is also World Bread Day and World Food Day. World Bread Day is an annual event set to coincide with World Food Day, where participants are invited to bake bread and share it. World Food Day is a yearly event put together by the UN Food and Agriculture Organization (FAO) to raise awareness and funds to feed the world’s chronically hungry. In ancient Rome, panis focacius was a flat bread baked in the ashes of the hearth (focus in Latin). This became a diverse range of breads that include “focaccia” in Italian cuisine, “hogaza” in Spain, “fogassa” in Catalonia, “fugassa” in Ligurian, “pogača” in the Balkans, “fougasse” in Provence, “fouaisse” or “foisse” in Burgundy. The French versions are more likely to have additions in the form of olives, cheese, anchovies etc, which may be regarded as a primitive form of pizza without the tomato. There is also in Portugal the “fogaça“, a sweet bread. This entry was posted in baking, BBBabes, bread - yeasted & unyeasted, bread recipe, food & drink, posts with recipes, PPN; YeastSpotting, MLLA, Bookmarks; T&C on Sunday, 16 October 2011 by ejm. Good morning to you lovely fougasses! Looking really nice Elizabeth. I’m happy to tell you that my fougasse is eh still just a thought soon to be transferred into something real. Which is an awkward way of telling you I’m laaate! Again. Starting the dough now. No really! Elizabeth I loved that fougasse, you are totally right it’s not at all like focaccia tho it’s made of the same dough. Very interesting indeed! Beautiful challenge Elizabeth and my hat is off to you for making the baking of fougasse in a barbecue work! Lovely breads. Thank you for choosing fougasse this month…it was fun and delicious. My post is just up…off to breakfast with friends soon. I agree with Elle, so clever to bake bread on a BBQ! Fougasse is a great bread, always a winner, great choice. Gorgeous shape! I’ve had fougasse with walnuts and yes it was excellent. Now I need to try that. LOVE the olive I just made! Really good but then I LOVED the olives going into it. So glad to do fougasse again. It’ll be on our evening wine table more often again. Yes, no knife, it’s made for hands. Great choice, so many options but all a crust-lover’s delight! I love the olive oil brushed on after baking, which I hadn’t done before.